We will be having a smaller event at West Coast Gojukai Dojo from 9:00 AM - 11:00 AM. Registration is from 8:30 - 9:00 - event begins at 9. The format and events will be similar to the skills challenge but on a smaller scale. Prizes will be given for 1,2,3,4th place in the events. We look forward to seeing your child at the event. This fun event is for students who are ages 4-13, white belt to blue belt. This year, it starts at 9 am and will finish at 11 am and will be held locally at the dojo. Parents tell us how thrilled they are with our event. Kids have fun and so do the officials and volunteers. 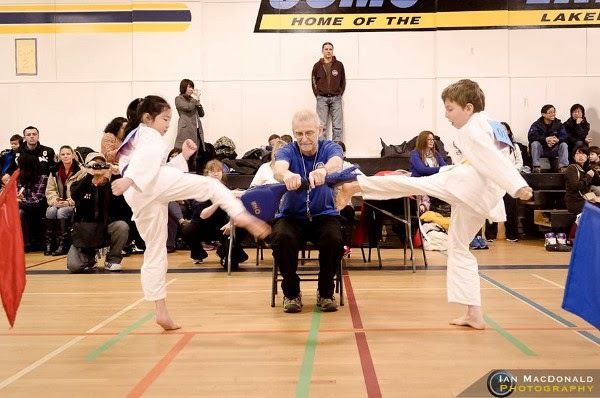 To date, our dojo is the only dojo in BC that hosts an entire event based on FUNdamentals in karate. The Skills Challenge was designed by Donna Gardecki to reflect the training and competitive needs of the young athletes as defined by our new Long Term Participant (Athlete) Development model (LTPD). Athletes under the age of 14, Novice and Intermediate, come out to enjoy themselves for 4 hrs doing a variety of activities and logging points for participation. We are all looking forward to seeing you this year! The Gojukai fist is the trademark of IKGA Canada West Coast Gojukai Karate is a member of the IKGA Canada and is a licensed user of the trademark.